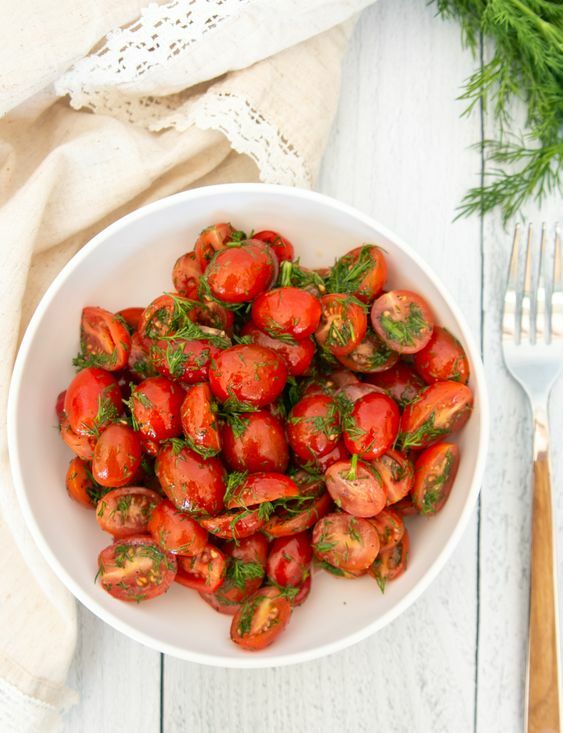 This is an easy and juicy balsamic tomato salad filled with vitamins and health benefits! Tomatoes could be used in a variety of recipes, but sometimes just a simple tomato salad like this one can give you the benefits of tomatoes quickly! 95% of tomatoes is water, and the other 5% consists of manly carbohydrates and fiber. Fresh tomatoes are also low in carbs, making it a great ingredient to add to almost any diet, especially if you are looking to lose or maintain your weight. This tomato salad is one of the easiest recipes that can be done in just a couple of minutes. You can choose to substitute dill for any other herb(s) of your choice. I like to use white balsamic vinegar in simple recipes like this one rather than dark balsamic vinegar; I find that it gives a lighter taste to the salad. Chop tomatoes, combine together all ingredients, and enjoy!